The name 'Val' stands for 'rampart' in English. Long ago there were real ramparts around Moscow, and their names still live in names of streets. There were also posts or gates in those ramparts, and the word 'zastava' means 'post'; as you can see, names of many Moscow squares remind of them. 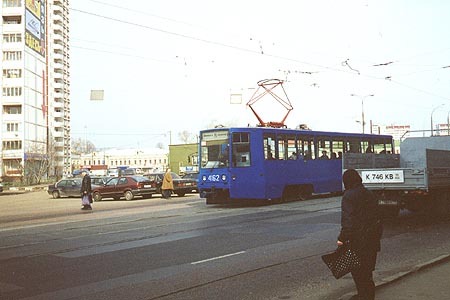 First electric trams made their appearance in Rogozhskaya Zastava Square in 1909, when a line from Yauzskiye Vorota Square had been built. A few decades later trams would surrender to trolleybuses leaving no trace of the original alignment of tracks. Meanwhile, another tram line was constructed in 1930 - the very line in Rogozhskiy Val Street that exists today. It can be mentioned that one of the first routes to operate on this line was route 46; this route, although significally changed with years, still uses the stretch in Rogozhskiy Val today. 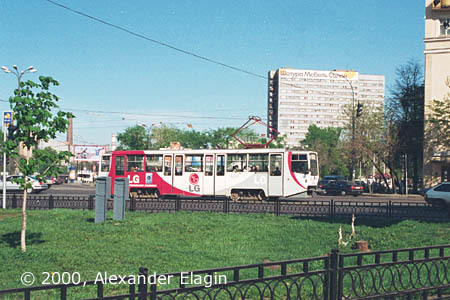 This tramcar is heading from Rogozhskaya Zastava Square towards Abelmanovskaya Zastava. The street connecting these squares is called Rogozhskiy Val. 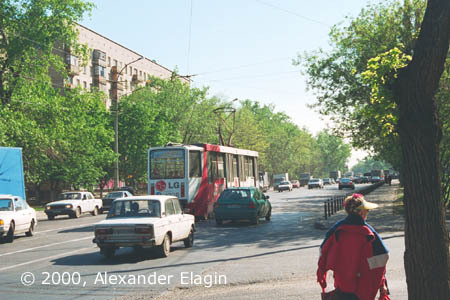 Here is the junction of Rogozhskiy Val and Shkolnaya Street. A few barely visible traces of the tracks that once branched to Shkolnaya can still be noted in the pavement but they are difficult to take pictures of. 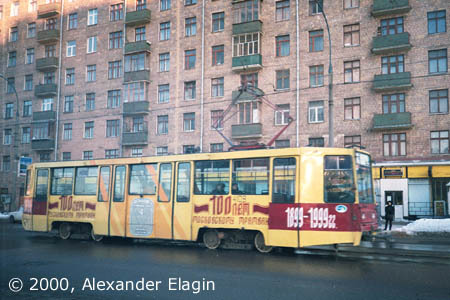 A centenial-decorated tramcar passing by a typical building of 1950's.